flatter elements, less gradients & shadows, more solid colors, etc. Most will agree that it’s an improvement, but nothing revolutionary. We’ll highlight a few of the key changes being made below, and explain them in further detail. Most of the placement of things remains untouched. Your admin bar is still fixed at the top of the page. The menu on the left. Publish button in the top-right metabox. Your settings pages have not changed. Installing & activating plugins is as easy as it’s always been. 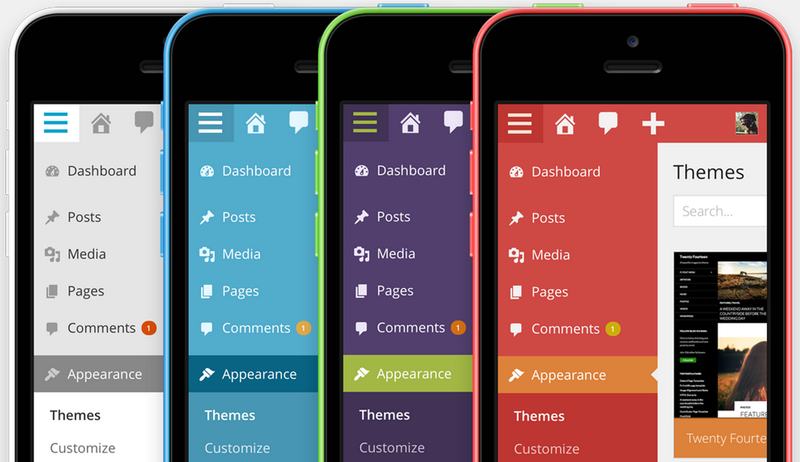 The 8 default admin color schemes in WordPress 3.8. There are now 8 admin color schemes to choose from. My personal favorite is Midnight. Give them a try by navigating to “Users” > “Your Profile”. If you’re looking for additional color schemes, install the Admin Color Schemes plugin (by the WordPress Core Team) to add even more options. The WordPress Admin Color Schemes plugin adds 8 more options. The new WordPress admin responsive design includes some nice improvements for mobile devices. Improved navigation for the main menu options on the left, similar to Facebook’s mobile app & the sidr plugin. Sub-menu items no longer open in a flyout. On click, they appear directly below the parent menu item. This is very similar to the desktop experience when you are already viewing a parent page. 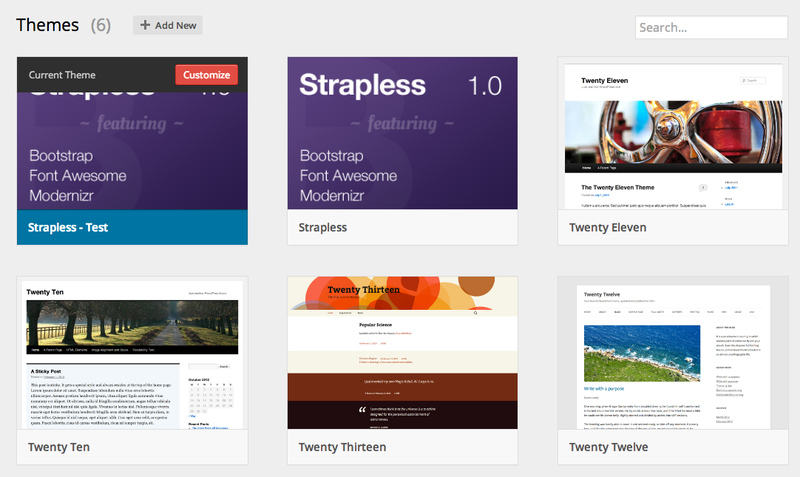 Browsing, previewing & activating new themes is now a little easier. The “Appearance” > “Themes” page has a new design. 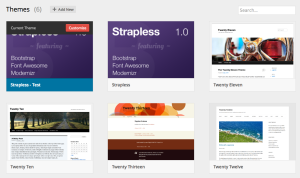 To learn more about a theme, simply click on its image (an “i” will appear on hover). This brings up a modal window with the full description, along with previous & next navigation so you can scroll right through all of your installed themes. There are quite a few changes being made to the dashboard (the first screen you see when you login to the WordPress admin). 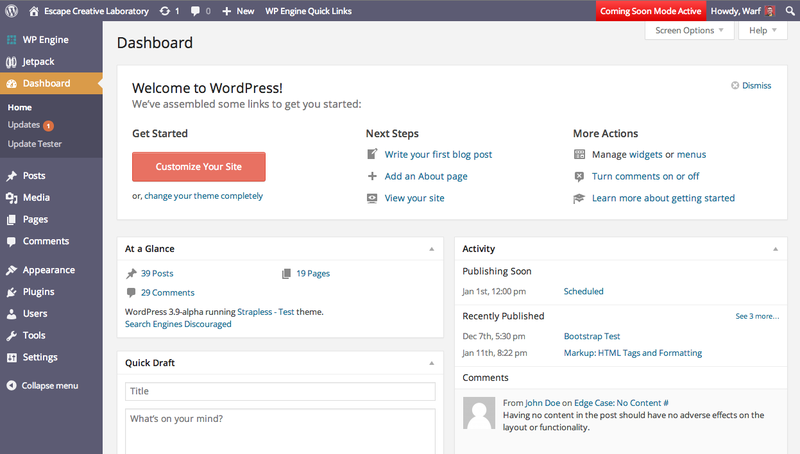 We’ve created a separate article that outlines all WordPress 3.8 dashboard updates. 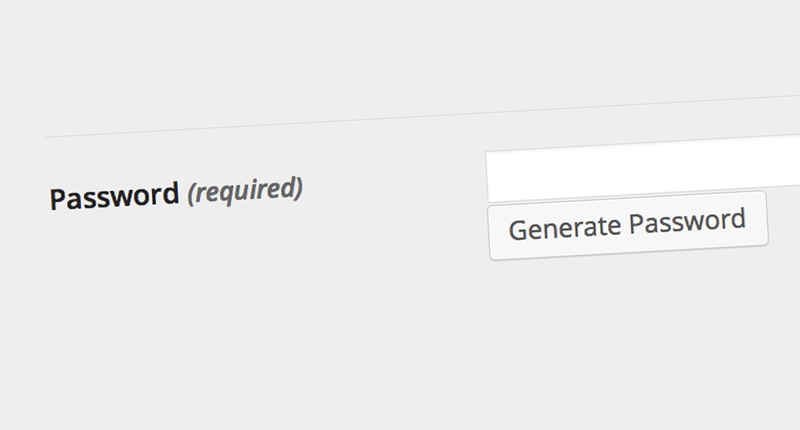 WordPress 3.8 has added a new “Generate Password” button to the “Users” > “Add New” screen. Previously, you had to make up your own password when creating new users. 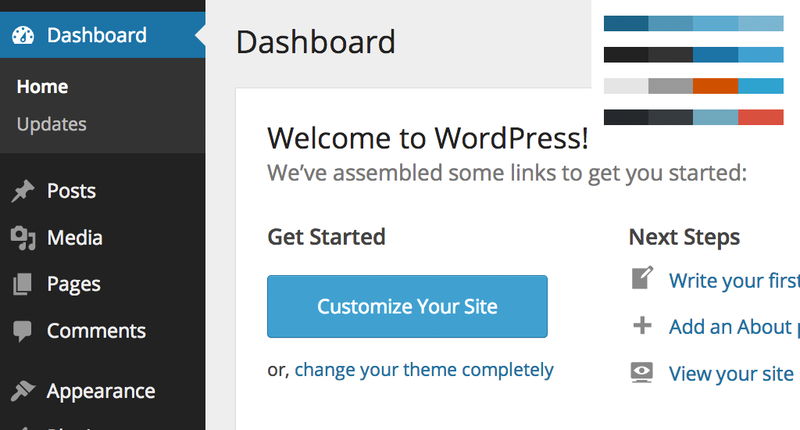 Now WordPress gives you the option to automatically create a strong one. This password can still be emailed to the user (in plain text, if their email program doesn’t use SSL), and you can still create your own if you’d like. Also keep in mind, the user can go to their profile page & change their password whenever they’d like, and there are no strength requirements when they do so. I see where WordPress is going with this, but if you want to read more, check out my article on why a password generator is a bad idea. Can’t find something? Not sure where something went? Struggling with the new design? Leave us a comment & we’ll try to help you get back on track. 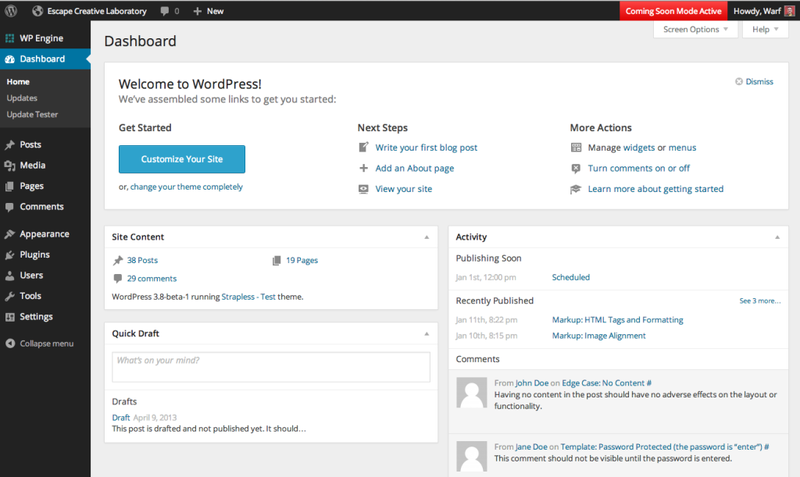 16 Commentson "WordPress 3.8 New Admin Design"
Hey there! Thanks for the post here. I have tried deleting ALL of the core WordPress files (only leaving my .htaccess, wp-config.php, and wp-content), and still no love! Any ideas? Check your browser’s Inspector (or Firebug). Look for the fieldset with the id of "color-picker". Maybe there’s an errant CSS rule that is hiding it. Cache: Clear your browser’s cache, as well as any server-side caching you might be doing. Some hosts (like WP Engine) cache things aggressively. Or if you’re using a plugin like W3 Total Cache, wipe that clean too. You could try going to Dashboard > Updates again, and using the “Update” button. If that doesn’t change anything, I’d download the nightly build, and then re-install it manually. Any luck on them showing back up for you? I can’t seem to open (to edit) my widgets anymore in wordpress 3.8. I can move them, add a new widget, but when I click the little arrow to open them, nothing happens!?? Any thoughts anyone? Thanks, turned out my theme was the problem. It had compatibility issues. I have updated my wordpress website to new version wp 3.8 but after this i can not access any of my website link including wp-admin. every link show error 404 not found except home page. my website is http://www.gcadz.com …. Sorry to hear what has happened to your site. From looking at your site (what I can see in Google SERPs, and the homepage), I’d guess it’s either 1) an issue with a plugin, or 2) an issue with your custom post types and/or taxonomies. It looks like a majority (if not all) of you site runs off custom post types & taxonomies. 2. I can’t create menus or add new element the existing ones. 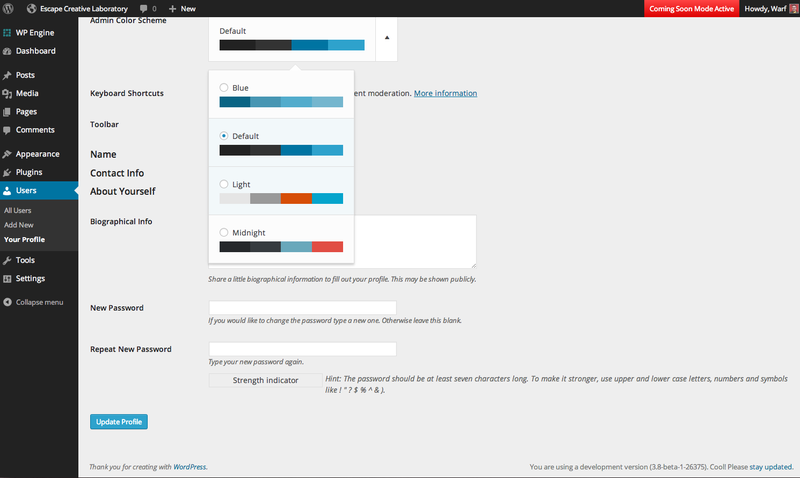 Check that you have the correct permissions (user level) to access the “Appearance” menu, and modify themes & menus. Go to “Users” > “All Users”, and you should see “Administrator” next to your name. 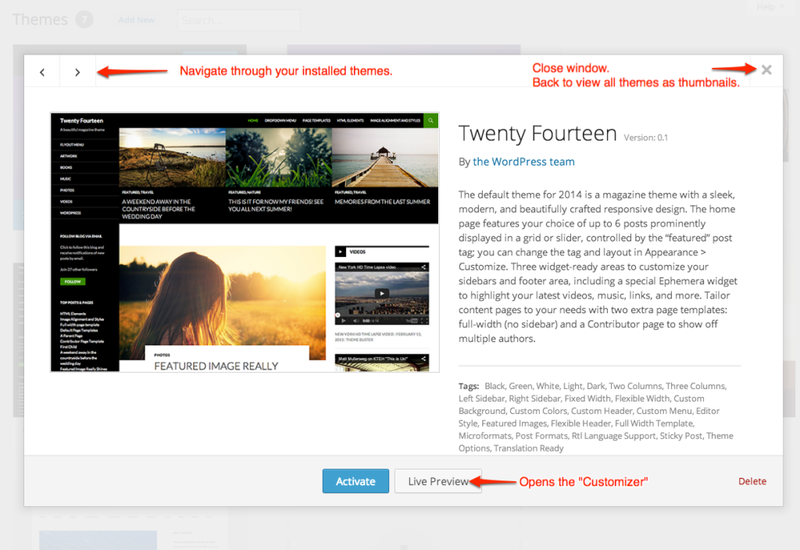 If you can’t see “All Users,” then you probably don’t have permission to edit themes & menus. Could be a plugin issue. Do you have any plugins installed that are affecting the admin area? Admin color schemes, custom user roles/permissions, etc. Try de-activating those plugins & see if that solves it. Re-install 3.8. There could be some issues with your 3.8 core files. Make a backup first. And just replace the core files in the root, wp-includes and wp-admin folders. This is a last resort, and if you’ve made any custom changes to those core files (hopefully you haven’t), be careful. Maybe even see if your web host can help. This may be a bit old but I found this post while researching a solution for my current problem. after the new interface I can’t find the Editor which was under Appereance first anymore. Where did they moved it to? I can’t do any changes to the coding.